A cymbal is a common percussion instrument. Often used in pairs, cymbals consist of thin, normally round plates of various alloys. The majority of cymbals are of indefinite pitch, although small disc-shaped cymbals based on ancient designs sound a definite note (see: crotales). Cymbals are used in many ensembles ranging from the orchestra, percussion ensembles, jazz bands, heavy metal bands, and marching groups. Drum kits usually incorporate at least a crash, ride or crash/ride, and a pair of hi-hat cymbals. A player of cymbals is known as a cymbalist. In orchestral scores, cymbals may be indicated by the French cymbales; German Becken, Schellbecken, Tellern, or Tschinellen; Italian piatti or cinelli; and Spanish platillos. Many of these derive from the word for plates. Cymbals have existed since ancient times. Representations of cymbals may be found in reliefs and paintings from Hittite Anatolia, Larsa, Babylon, Assyria, ancient Egypt, ancient Greece, and ancient Rome. References to cymbals also appear throughout the Bible, through many Psalms and songs of praise to God. 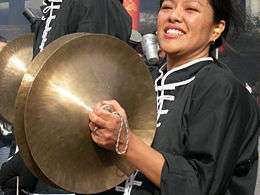 Cymbals may have been introduced to China from Central Asia in the 3rd or 4th century AD. The anatomy of the cymbal plays a large part in the sound it creates. A hole is drilled in the center of the cymbal and it is used to either mount the cymbal on a stand or straps (for hand playing). 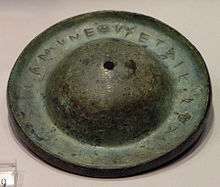 The bell, dome, or cup is the raised section immediately surrounding the hole. The bell produces a higher "pinging" pitch than the rest of the cymbal. The bow is the rest of the surface surrounding the bell. The bow is sometimes described in two areas: the ride and crash area. The ride area is the thicker section closer to the bell while the crash area is the thinner tapering section near the edge. The edge or rim is the immediate circumference of the cymbal. Orchestral crash cymbals are traditionally used in pairs, each one having a strap set in the bell of the cymbal by which they are held. Such a pair is always known as crash cymbals or plates. The sound can be obtained by rubbing their edges together in a sliding movement for a "sizzle", striking them against each other in what is called a "crash", tapping the edge of one against the body of the other in what is called a "tap-crash", scraping the edge of one from the inside of the bell to the edge for a "scrape" or "zischen," or shutting the cymbals together and choking the sound in what is called a "hi-hat chick" or crush. A skilled player can obtain an enormous dynamic range from such a pair of cymbals. For example, in Beethoven's ninth symphony, the percussionist is employed to first play cymbals at pianissimo, adding a touch of colour rather than loud crash. 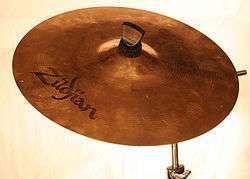 Crash cymbals are usually damped by pressing them against the player's body. A composer may write laissez vibrer, "Let vibrate" (usually abbreviated l.v. ), secco (dry), or equivalent indications on the score; more usually, the player must judge exactly when to damp the cymbals based on the written duration of clash and the context in which it occurs. Crash cymbals have traditionally been accompanied by the bass drum playing an identical part. This combination, played loudly, is an effective way to accentuate a note since the two instruments together contribute to both very low and very high frequency ranges and provide a satisfying "crash-bang-wallop". In older music the composer sometimes provided just one part for this pair of instruments, writing senza piatti or piatti soli (Italian: "without cymbals" or "cymbals only") if only one of the instruments is needed. This came from the common practice of only having one percussionist play both instruments, using one cymbal mounted to the shell of the bass drum itself. The player would crash the cymbals with his left hand and use a mallet to strike the bass drum in his right. This method is often employed today in pit orchestras and is called for specifically by composers who desire a certain effect. Stravinsky calls for this in his ballet Petrushka and Mahler calls for this in his Titan Symphony. The modern convention is for the instruments to have independent parts. However, in kit drumming, a cymbal crash is still most often accompanied by a simultaneous kick to the bass drum, which provides both a musical effect and a support to the crash stroke. Another use of cymbals is the suspended cymbal. This instrument takes its name from the traditional method of suspending the cymbal by means of a leather strap or rope, thus allowing the cymbal to vibrate as freely as possible for maximum musical effect. Early jazz drumming pioneers borrowed this style of cymbal mounting during the early 1900s and later drummers further developed this instrument into the mounted horizontal or nearly horizontally mounted "crash" cymbals of a modern drum kit, However, most modern drum kits do not employ a leather strap suspension system. Many modern drum kits use a mount with felt or otherwise dampening fabric to act as a barrier to hold the cymbals between metal clamps: thus forming the modern day ride cymbal. Suspended cymbals can be played with yarn, sponge or cord wrapped mallets. The first known instance of using a sponge-headed mallet on a cymbal is the final chord of Hector Berlioz' Symphonie Fantastique. Composers sometimes specifically request other types of mallets like felt mallets or timpani beaters for different attack and sustain qualities. Suspended cymbals can produce bright and slicing tones when forcefully struck, and give an eerie transparent "windy" sound when played quietly. A tremolo, or roll (played with two mallets alternately striking on opposing sides of the cymbal) can build in volume from almost inaudible to an overwhelming climax in a satisfyingly smooth manner (as in Humperdink's Mother Goose Suite). The edge of a suspended cymbal may be hit with shoulder of a drum stick to obtain a sound somewhat akin to that of a pair of clash cymbals. Other methods of playing include scraping a coin or a triangle beater rapidly across the ridges on the top of the cymbal, giving a "zing" sound (as some players do in the fourth movement of Dvořák's Symphony No. 9). Other effects that can be used include drawing a cello or bass bow across the edge of the cymbal for a sound not unlike squealing car brakes. ↑ cymbalum. Charlton T. Lewis and Charles Short. A Latin Dictionary on Perseus Project. ↑ κύμβαλον. Liddell, Henry George; Scott, Robert; A Greek–English Lexicon at the Perseus Project. ↑ κύμβη in Liddell and Scott. ↑ Harper, Douglas. "cymbal". Online Etymology Dictionary. ↑ Blades, James (1992). Percussion instruments and their history. Westport, Conn.: Bold Strummer. p. 380. ISBN 978-0933224612. Chisholm, Hugh, ed. (1911). "Cymbals". Encyclopædia Britannica (11th ed.). Cambridge University Press.